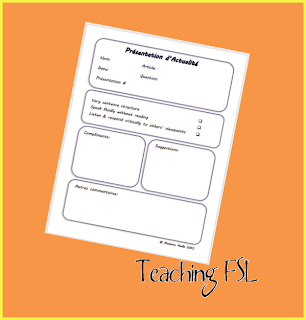 Teaching FSL: Lessons From The Middle BTS Giveaway & a Late "Friday Freebie"
Lessons From The Middle BTS Giveaway & a Late "Friday Freebie"
Yesterday (or was it the day before the day before...?) on my facebook page, I alluded to the fact that I had a new freebie coming your way. I located and uploaded the feedback sheet I made to correspond with my Current Events presentations in French, This is just a little something to keep me organized as well as to keep me focused on the expectations from the Ontario French curriculum which I aimed to be evaluating while students are presenting. I'm considering it a late Friday Freebie, since I actually forgot yesterday was Friday until quite late in the evening! The prizes include . . . Multiple TPT shopping sprees in sellers' stores to help you get all stocked up for a new school year ~ $10 Starbucks gift certificate to get the year started on the right foot ~ $75 gift certificate at WiseDecor to make your classroom even more inviting for your students with beautiful wall decals ~ $25 gift certificate at Black Rafter Soap Works to pamper yourself a little bit after the first big week back ~ Cool Duo Binders to get you organized easily ~ An awesome tote from Thirty-One - who doesn't love a new bag? There are several prize packages to be won! Make sure to enter to win each of the prize packages - they're all fantastic and you don't want to miss out!